This March, I was able to spend a week at the National Library of Medicine as an volunteer through the School of Information’s Alternative Spring Break program at the University of Michigan. The National Library of Medicine [NLM] is the largest medical library in the world, located on the campus of the National Institutes of Health in Bethesda, MD. This year, 112 students were placed with 48 host organizations in 4 cities. You can explore the ASB 2010 website to see the organizations, projects, blog posts and other information related to this year’s trip. While I wasn’t sure what types of exhibitions they put together or what types of materials I would be working with, I knew that it would be good, hands-on experience. My co-volunteer, Heather, & I were given large binders of materials that were used in past exhibitions. Our task was to take out all the photos, sort out duplicates, put the photos into acid-free sleeves, label the photo with its exhibition number and put them into new containers. Over the course of the week we were able to get through not only the materials for one exhibition, but also the binders for all the past exhibitions. Additionally, we updated the catalog records for the materials that had been moved and rehoused. By the end, we reduced the size of the assets from 8 cubic feet, down to 3 cubic feet. Everyone we met was so helpful, friendly and enthusiastic and it felt feel like we were really able to accomplish something for them – especially since they remarked a number of times that this was a project that had wanted to do for a while, but didn’t have the time or the resources. If your organization is located in Chicago, Washington D.C., New York City or Detroit & is interested in hosting an SI student next Spring Break, check out this organization FAQ page. You can also explore the types of projects offered by other organizations to get an idea of what has been done in the past. Joining an organization for just one week presents a lot of limitations – time being the biggest. It can be difficult to strike a balance between an interesting project and one that can be accomplished without spending too much time on training. While my project wasn’t the most challenging, the chance to experience a professional work environment, learn more about typical day-to-day tasks and explore future career options was invaluable. Lastly, since you may not be able to take a similar Spring Break trip, check out the NLM’s Associate Fellows Program if you’re a recent grad interested in medical libraries and archives. It’s a year-long program and it provides a lot of fantastic experience and training. Thanks to Lance for allowing me to contribute! Please share any thoughts, questions or comments! We are very pleased to have D.S. Apfelbaum as a Guest Contributor this week. D.S. will be graduating from the M.S.L.I.S./Archives Certificate program at Long Island University this May. Please be sure to also check our her blog at http://thebookofdan.wordpress.com. Thanks for the contribution! ~ ed. 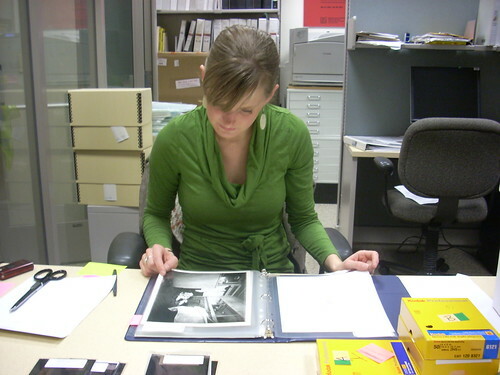 When Lance recently blogged about resolving to get more involved in community service projects in 2010, I was reminded of a time – now, almost two years ago – when I first began to consider volunteering at an archival repository. For me, it was an easy decision – not only was I fortunate enough to have a schedule that would accommodate volunteer work, but, as Lance also mentioned, I knew it would complement my courses while building my résumé. Three organizations and a couple of jobs later, I would say I made a fairly safe prediction. The obvious benefits aside, though, volunteering has paid off in ways I could have never imagined at the outset. I hope that in sharing my experiences I will: 1) bring some of those hidden perks to light and 2) elucidate essential aspects of the volunteer process as it relates specifically to archives. Finding repositories can be difficult if you don’t know where to look, especially if you’re just starting out and aren’t familiar with your local, regional, and/or national archival associations. The best place to begin is the SAA site. There, you’ll find a listing of local and regional archival organizations in the U.S. and Canada, which will lead you to institutions in your area. For example, those of us in the New York have the Archivist’s Roundtable (NYART), as well as the Mid-Atlantic Regional Archives Conference (MARAC) and the New York Archives Conference (NYAC). Both NYART and MARAC maintain an extensive listing of member sites, so it’s easy to find the contact information for a variety of archival repositories. Another great resource: your graduate program (that is, if you’re currently enrolled). Whether you’re going for the full M.S. or just the archives certificate, chances are your program has at least one email listserv and/or a wiki (the Palmer School, where I’m currently a student, has both). Granted, if you’re in a distance-learning program or on a satellite campus, much of the local service opportunities posted on that particular listserv/wiki may not be of much help. However, it never hurts to shoot a quick email inquiring into information about opportunities or organizations in your area. Incidentally, if you find that your listserv advertises far more internships than volunteer gigs, feel free, if there’s an organization you’re drawn to in particular, to inquire about the possibility of volunteering there. The worst they can do is to refuse you (and it does happen, but more on that in a bit). Of the four archival repositories I’ve applied to as a volunteer, three have required an interview. Though interviewing, itself, is rarely pleasant, the experience is definitely one those less-obvious perks. Think about it – where else will you get a no-stakes opportunity to practice convincing an established professional that your coursework and experience make you the choice candidate? It’s also the perfect occasion to start thinking about your transferable skills and how to turn specific aspects of your non-archival professional experience into assets for future archival work. That said, if you are asked to come in for interview for a volunteer position, treat it as if it’s the real deal: dress appropriately, have a decent grasp on the organization, and know how much time you will be able to commit. Remember: you never lose points for professionalism. If I hadn’t realized at first how helpful the interview process would be, I certainly never imagined that volunteering would allow me to cultivate serious professional relationships to the extent that it has, let alone put me in the running for paid positions. When it comes to mentors, I have been extremely lucky. I have had gracious supervisors who have not only been willing to discuss their experiences, but who have also gone out of their way to actively engage me in discussions about relevant trends and issues in archival science. What’s more, their faith in my abilities has boosted my confidence as a burgeoning archives professional. In particular, I regard it as a privilege to have been allowed by the archivist at the Oyster Bay Historical Society to plan, create, and install the Archives Month Exhibit (which has now traveled to LIU). It was a completely unexpected experience that has now left me with an invaluable skill set. While my volunteer work has yet to secure me a full-time position with ample vacation and an opt-in dental plan, it has led to paid, part-time work in archival repositories. My first experience was with the National Archives at New York. In the spring of 2009, I found myself having to commute from Long Island to NYU for classes. With a 4:30pm start time, it was a bit of a day-killer, so I contacted NARA about volunteering at the agency’s Varick Street location during the morning and early afternoon. Admittedly, it didn’t work out the way I had planned – only three months in, a change in personal circumstances and scheduling precluded my volunteering with the organization further. Needless to say, after committing to volunteering the whole semester and having to pull out half-way through, I was extremely embarrassed. I never expected, after such a short time and an abrupt departure, that I would later be contacted with the opportunity to work for NARA over the summer as a temporary Archives Technician. My second experience was just as surprising as the first. Again, faced with a little extra time during the week, I decided to volunteer at LIU’s B. Davis Schwartz Library in the Digital Initiatives/Art Slide Department, which is currently working on a huge project involving the archives of William Randolph Hearst. During my time there in the fall of 2009, I worked on small things, like rehousing documents and scanning photo files. But, being a student in the M.S.L.I.S. program and having familiarized myself with the staff and department projects, I suppose it made it that much easier for me to slip into the graduate assistant’s position after she accepted a job at another library. The bottom-line: even a few hours of quality volunteer work can make a big impression on potential employers. If you find yourself in a similar situation, there’s good news and bad news. The bad news, first: if you’re not enrolled in an accredited program during the time in which you plan to volunteer for an organization that enforces an interns-only policy, there’s very little you can do. However, if you are in a program, consult BOTH your academic advisor and your university’s career office for further guidance. Unfortunately, when I petitioned my graduate advisor for advice, I was given only the option of doing an independent study. I declined, since I didn’t think it was an experience worth the $800 I would have had to shell out for a single credit. For whatever reason, I wasn’t pointed in the direction of LIU’s cooperative education office which would have ameliorated several conflicts. First, participating in the Co-op program would have solved the problem of needing official university support. To take part, students must register for a section of Experiential Learning; thus I would have been able to call myself an intern. Second, since the class functions as a no-credit course, it would have been free. Had I known then what I know now – that I should have consulted with the career office before giving up – I might have been able to volunteer at that small library after all. Nevertheless, I still managed to find professionally meaningful service opportunities. I can’t guarantee that if you volunteer you’ll have the same experiences I’ve had, even though I hope that you do (well, except for the whole rejection bit – that sucked). What I will say, though, is that if you’re on the fence about volunteering, consider the potential perks: a chance to flex your muscles as an interviewee; a career-long mentor; a new skill; a job. And, let’s not forget — the chance to do some good. After all, altruism looks great on everybody. While I am not sure if three links really constitute a “O-Rama” type situation, we wanted to pass along some interesting things that have been posted over the past couple of weeks. Enjoy!